Materials Needed: white paper, markers, scissors, and painter's tape. Trace your child's foot onto white paper several times to create footprint ghosts. Add black eyes and different colored shapes for the mouth using markers (we did hearts, circles, triangles, squares, rectangles, ovals, and diamonds). Tape the footprints in a large circle onto your floor. Turn on your favorite spooky tunes- my kids loved Ghostbusters for this game! Have the children walk around the ghost footprint circle stepping on each ghost. Stop the music and call out the name of a shape. Kids have to move to go and find that shape and stand on that footprint. Celebrate their accomplishment... and then start the music again! My four year old loved "helping" his almost 2 year old sister if she couldn't find the right shape. It was really cute to watch them working together! ** Sometimes when the music stopped I just had the kids tell me what shape they were standing on. Sometimes when the music stopped I told them to do a specific action on a specific shaped ghost. For example, "Go sit on the ghost with the triangle mouth" or "Hop on the ghost with the oval mouth." This game is very easy to modify for different ages/skill levels. You could make it harder and write numbers, letters, or words on the ghosts. You could make it easier by just having kids learn about colors and skip talking about shapes. 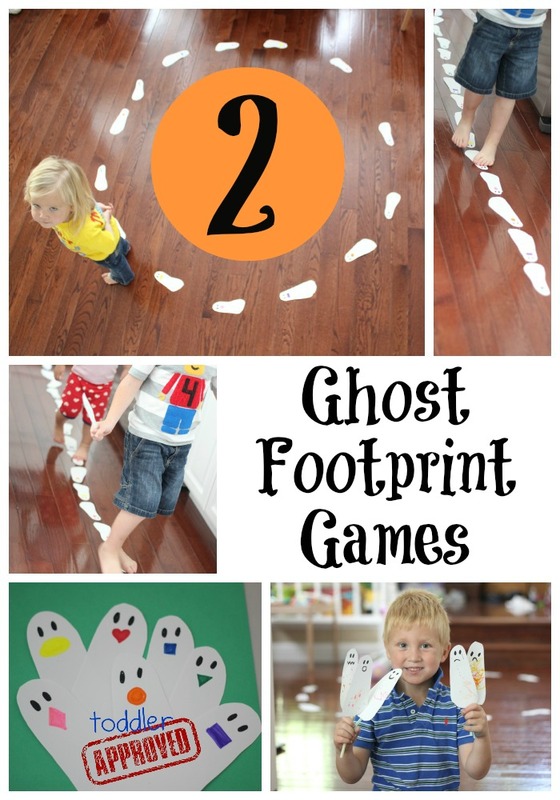 After a few days we finally pulled the ghosts off the floor... but they didn't make it very far because the kids wanted to tape them to the kitchen floor to play another game they made up- Ghost Long Jump! Materials Needed: a few footprint ghost puppets, several footprint ghosts taped onto the floor into a long line, and space to run! This would be fun indoors or outdoors. 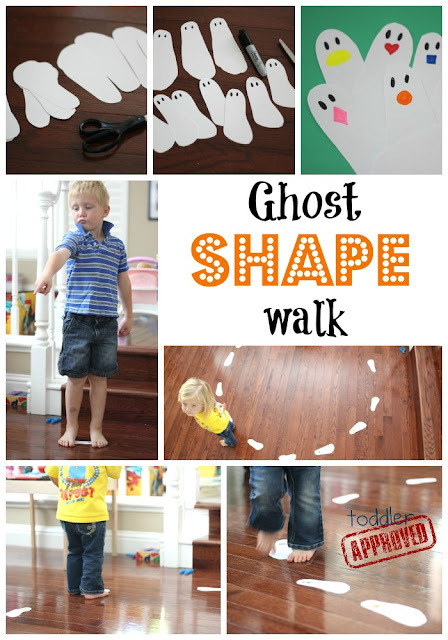 Grab a ghost puppet and start at a point far across the room from the long line of ghost footprints. Have one child go at a time and run towards the line of ghosts and jump to see how far they can fly over the ghosts. Once they land, have them determine where they fell and count how many footprint ghosts they jumped over. Have that child go back to line and allow another child a turn to run and jump and do the ghost "long jump." 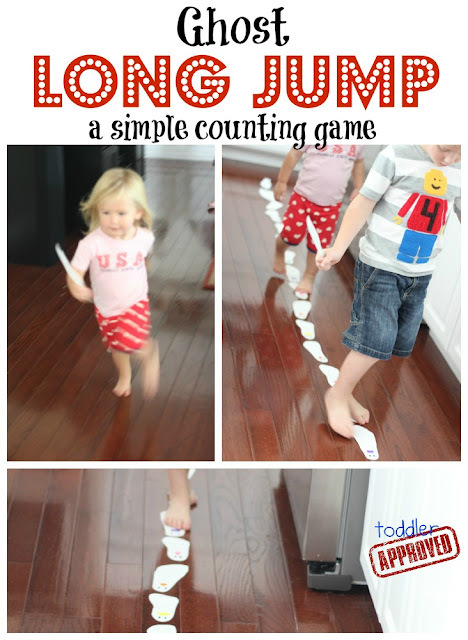 We didn't keep track of score or distances, but my kids loved running, jumping, counting, and then running and jumping again! It was amazing how good they were at taking turns and waiting. I also thought it was adorable to see their little ghost puppets soaring through the air and I loved watching my toddler attempt to count the feet while she walked on them. Make sure you have sufficient space to play this game and play in an area where your child won't bump into anything. Please also make sure you always supervise your child when they are playing active games like this! What other things could you do with ghost footprints? A Facebook follower shared her Ghost Garland that she created using her child's footprints. 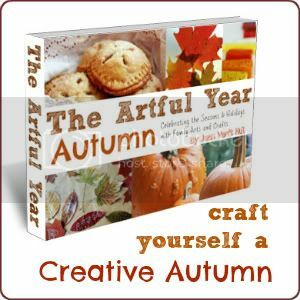 We'd love to see anything you create... so share a photo on our Facebook page or in the comments! Thanks Marnie! I agree- integrating movement with learning is the most fun! We also. These are these kind of activities that make us smile and enjoy. We love the ghost footprint game! We used index cards instead of cutting them out of paper and it worked really well.